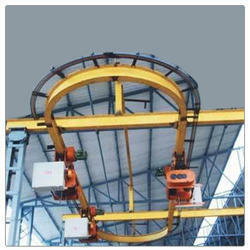 We are leading manufacturers and suppliers of Electric Hoists. We supply a broad assortment of electric hoists, which are fabricated with premium quality raw material and designed at our state-of-the-art facility. The modular construction consists of various parts of electric hoists such as gear box, control panel and motors are easily accessible and made repairs and maintenance simple. 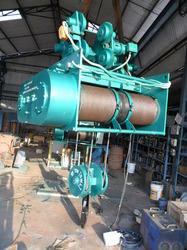 Further, electromagnetic brakes are provided on hoisting motion ensure complete safety even in case of power failure. Our clients can avail these hoists in varying strengths and capacities as per their needs. We are the leading manufactures and suppliers of Electric Hoists in Coimbatore, Mettupalayam, Salem, Tirupur, Pollachi, Trichy, Salem, Erode, Madurai, Tirunelveli , Chennai, Nagarkovil, Kanniyakumari, Tuticorin, Namakkal, Vellore,Theni, Dindugul, Ooty, Kunoor, Valparai, Kodaikanal, Kannur, Kozhikode, Malappuram, Palakkad, Wyanad, Kasargod, Kalpatia, Thrissur, Eranakulam, Iduki, Kootayam, Alapuzha, Kollam, Thiruvananthapuram, Patmanathitta, Kurnool, Anantapur, Cuddapah, Nellore, Chitoor, Prakasam, Guntur, Krishna, West Godaveri, East Godaveri, Vishakapattinam, Chikmangalur, ChitraDurga, Hassan, Tumkur, Mandya, Bangalore, Kodagu, Mysore, Kolar, Tamilnadu, Karnataka, Andrapradesh, Kerala and India..
We are leading manufacturers and suppliers of Monorail Hoists. We supply a broad assortment of monorail hoists, which are fabricated with premium quality raw material and designed at our state-of-the-art facility. The modular construction consists of various parts of monorail hoists such as gear box, control panel and motors are easily accessible and made repairs and maintenance simple. Further electromagnetic brakes are provided on hoisting motion ensure complete safety even in case of power failure. Our clients can avail these hoists in varying strengths and capacities as per their needs. We are the leading manufactures and suppliers of Monorail Hoists in Coimbatore, Mettupalayam, Salem, Tirupur, Pollachi, Trichy, Salem, Erode, Madurai, Tirunelveli , Chennai, Nagarkovil, Kanniyakumari, Tuticorin, Namakkal, Vellore,Theni, Dindugul, Ooty, Kunoor, Valparai, Kodaikanal, Kannur, Kozhikode, Malappuram, Palakkad, Wyanad, Kasargod, Kalpatia, Thrissur, Eranakulam, Iduki, Kootayam, Alapuzha, Kollam, Thiruvananthapuram, Patmanathitta, Kurnool, Anantapur, Cuddapah, Nellore, Chitoor, Prakasam, Guntur, Krishna, West Godaveri, East Godaveri, Vishakapattinam, Chikmangalur, ChitraDurga, Hassan, Tumkur, Mandya, Bangalore, Kodagu, Mysore, Kolar, Tamilnadu, Karnataka, Andrapradesh, Kerala and India..
We have carved a niche for ourselves by providing our clients with a qualitative array of Curved Path Electric Hoists. The offered electric hoists are appreciated for their longer service life. We design the offered electric hoists by utilizing the excellent quality material and leading techniques keeping in mind the set norms. 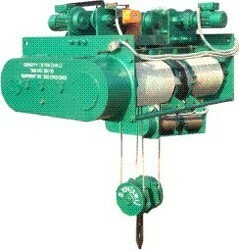 Additionally, we are giving these electric hoists only after checking properly against numerous parameters. Lift: 6 Mtrs. to 80 Mtrs. We are the leading manufactures and suppliers of Curved Path Electric Hoists in Coimbatore, Mettupalayam, Salem, Tirupur, Pollachi, Trichy, Salem, Erode, Madurai, Tirunelveli , Chennai, Nagarkovil, Kanniyakumari, Tuticorin, Namakkal, Vellore,Theni, Dindugul, Ooty, Kunoor, Valparai, Kodaikanal, Kannur, Kozhikode, Malappuram, Palakkad, Wyanad, Kasargod, Kalpatia, Thrissur, Eranakulam, Iduki, Kootayam, Alapuzha, Kollam, Thiruvananthapuram, Patmanathitta, Kurnool, Anantapur, Cuddapah, Nellore, Chitoor, Prakasam, Guntur, Krishna, West Godaveri, East Godaveri, Vishakapattinam, Chikmangalur, ChitraDurga, Hassan, Tumkur, Mandya, Bangalore, Kodagu, Mysore, Kolar, Tamilnadu, Karnataka, Andrapradesh, Kerala and India..